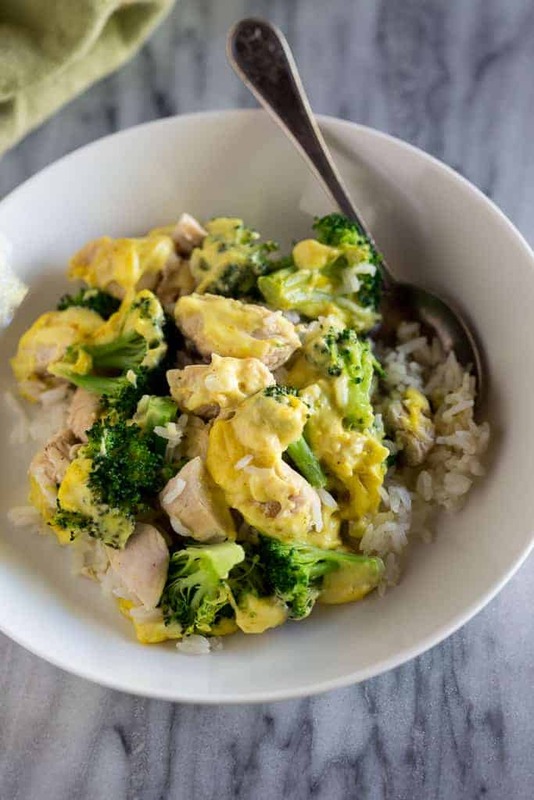 This delicious Chicken Divan casserole is made with rice, broccoli, chicken and a creamy curry sauce. It’s a healthier version of the traditional chicken divan casserole, and your family will LOVE it! When my little boy was 4-years-old he made an “all about me” book in his preschool class. On one of the pages they wrote and drew a picture of their favorite food. Most of the kids wrote typical things like “pizza” or “chicken nuggets” but his teachers got a huge kick out of his, which was “chicken divan”! It’s his favorite food to this day, and every one of my kids shouts for joy when chicken divan is on the menu, which is just like me and my siblings when my mom would make it for us growing up. Traditional chicken divan is loaded with cheese, sour cream and bread crumbs, but I far prefer this healthier version!. There’s so much flavor in the yummy sauce and this is a super easy dish for a weeknight meal. 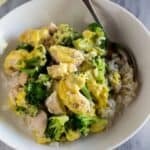 Creamy chicken curry sauce layered over rice, chicken and vegetables. It’s basically a healthier version of chicken and broccoli casserole. I love that you can make it first thing in the morning and pop it in the oven at dinner time. Chicken divan has been a popular American casserole for many years. 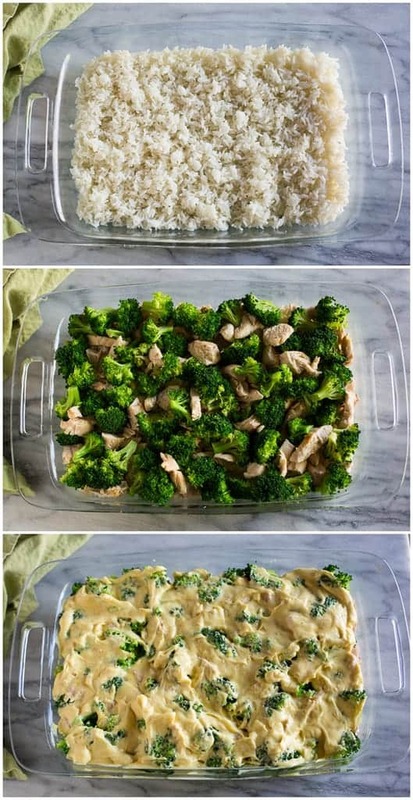 Chicken divan is essentially a a rice casserole layered with chicken, broccoli, and a creamy curry-like sauce. Traditional chicken divan is topped with a layer of cheese and baked in the oven. First prepare 3 cups of cooked rice, one head of streamed broccoli, and about 7 cooked chicken tenders. Next, make the sauce by mixing cream of chicken soup, mayonnaise or Greek yogurt, lemon juice, and curry powder. Finally, assemble the chicken divan casserole by layering the rice, chicken and broccoli and then sauce. Bake it in the oven at 350 for 25 minutes! It’s that easy! 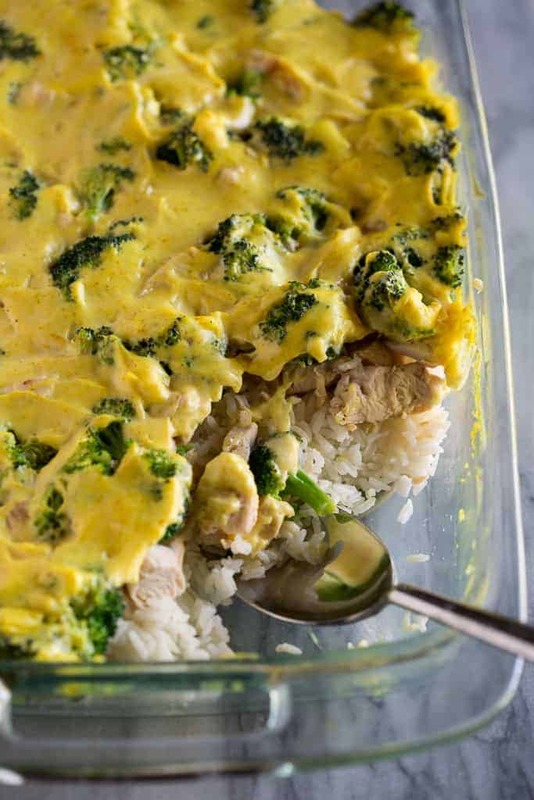 This delicious Chicken Divan casserole is made with rice, broccoli, chicken and a creamy curry sauce. It's a healthier version of the traditional chicken divan and I'm confidant your family will LOVE it! Meanwhile, season the chicken on both sides with salt and pepper and cook in a hot skillet until no longer pink, flipping once. Allow the chicken to rest for 5 minutes before chopping into pieces. Spoon the cooked rice into a 9x13'' pan or similar size casserole dish. Layer cook chicken and steamed broccoli on top of the rice, followed by steamed broccoli pieces. Make the sauce by mixing the cream of chicken soup, mayonnaise or yogurt, lemon juice and curry powder. Spoon sauce over the top of the chicken and rice. Prepare recipe up to step 5. Cover and refrigerate up to 1 day ahead. Remove from fridge while your oven preheats. Bake as directed. *I originally shared this recipe March 2014. Updated November 2018. This looks so yum! I love cooking with broccoli. My kids actually love it too! This is one of our families favorite recipes (not the skinny version) – in fact I was just talking to my mom about it and she’s making it for family dinner on Sunday. I’m gonna have to pass this version of it on to her! Thanks lady! I love chicken divan! But I use miracle whip and a little brown sugar. It looks delicious. I’ve never had this dish. I think my kids will enjoy it. Is this really Chris’s favorite?? My whole family makes fun of me because it is my favorite meal! (Not the skinny version though, haha)! Ours never had bread crumbs in it though. Its fun how there are so many different variations of a classic! I made this last week for my family of boys and everyone absolutely loved it. The sauce is so good, and I love how easy it was. I used a box of wild rice and some cooked white rice that I had leftover in the fridge. This was my favorite meal growing up! We called it chicken broccoli casserole and our recipe is basically identical to yours. I’ve never seen it outside my family.